Alberta Labour Minister Christina Gray is standing firm on the province's plan to increase the minimum wage to $15 an hour by 2018. Alberta Labour Minister Christina Gray is standing firm on the province's plan to hike the minimum wage to $15 an hour by 2018, despite growing pressure from the restaurant industry. Gray was responding to a campaign by Restaurants Canada urging the province to delay plans to hike the minimum wage by the end of the government's first term in office. The group launched a campaign Thursday called Not The Time that asks the government to restructure its plan. "I have to say this is exactly the time for a fair wage because all Albertans deserve a living wage," Gray said in a telephone interview Friday. "We've got too many hard-working people and hard-working parents struggling to make ends meet." The campaign encourages Albertans to send a pre-written email to their MLA stating the plan to raise the minimum wage is well-intentioned, but it will hurt workers if implemented too quickly during a recession. 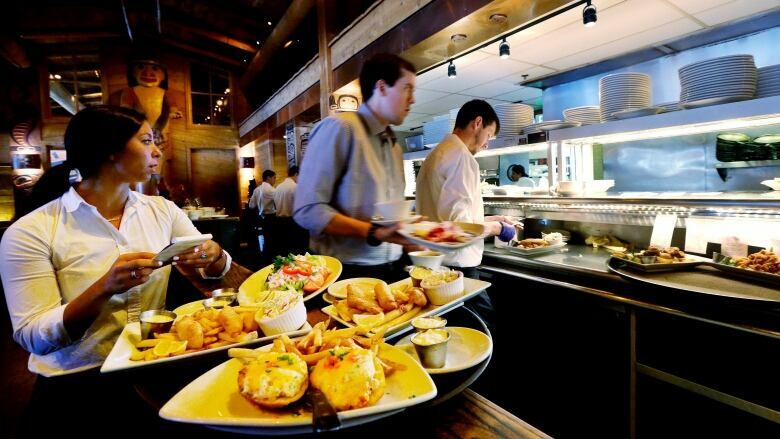 "We're not saying we're not going to get to $15 an hour, eventually we're going to get there," said Mark von Schellwitz, Restaurants Canada's vice president for Western Canada. "But imposing a 50-per-cent increase in just three years ... during a recession is just too much, too fast right now." Schellwitz said the sluggish economy means fewer people are spending money at restaurants, so there's little room to raise menu prices. As a result, some businesses would have to cut hours or lay off staff to afford higher wages. "When sales are good and the economy is strong we're far better able to absorb any significant minimum wage increases," Schellwitz said. A cut-back in hours hurts those workers who rely on earning gratuities to supplement their wages, he added. The Restaurants Canada campaign includes a petition and half-a-dozen formal consultation meetings planned in June. Schellwitz said he hopes it will be enough to change the province's course on wage hikes by the end of the month. At least one Edmonton-area barista said she wouldn't sign her name to that petition. Ellie W., who asked not to be fully identified to avoid repercussions from her employer, makes $11.80 an hour at Starbucks. Alberta's current minimum wage is $11.20 an hour for most workers and $10.70 for those serving liquor. With 20 hours a week guaranteed in her contract, Ellie said her monthly paycheck is barely enough to cover living costs and the gas she needs to drive to work. Gratuities add up to about $10 a week, once the extra cash is shared between employees at the coffee shop. For Ellie, a higher minimum wage promises "that little bit extra for a feeling of security." The 19-year-old plans to start a university degree in September. But she'll need student loans because her income barely makes a dent in tuition, she said. "It would mean I don't have to stress every month about whether I'm working over 30 hours a week, or not to be sure that I am able to cover my living costs and I'm able to save some of that for school as well," she said. Approximately 59,000 Albertans earn minimum wage, according to the Alberta Labour department. Almost half of those employees work full time, and more than two-thirds have permanent jobs. Gray said she wants to work in partnership with businesses to raise the minimum wage at a realistic rate. That's why Alberta Labour is engaging in ongoing discussions with businesses, include stakeholders from Restaurants Canada. "They'll absolutely have a place at our table," Gray said. "We are focused on meeting our goal of $15 an hour by 2018, but we want to do that in a way that works for everyone." The province's plan to take the sting out of the higher minimum wage includes tax exemptions for small businesses and subsidized student employment programs for young workers. Alberta's last minimum wage hike happened in October 2015. Gray said the province will give businesses at least three months notice before the next increase, although no firm date has been set. She noted Restaurants Canada does not represent all workers in Alberta's food service industry. The group is "definitely an important stakeholder, but isn't the only one in that sector," she said. Ellie W., for one, said she doesn't feel represented by the Restaurants Canada campaign as it overlooks food service workers such as herself who don't earn high gratuities. "I don't think it's fair," she said. "People who don't have to worry about having to live off this much money don't understand." Alberta's $15 minimum wage: How many will actually get a raise?